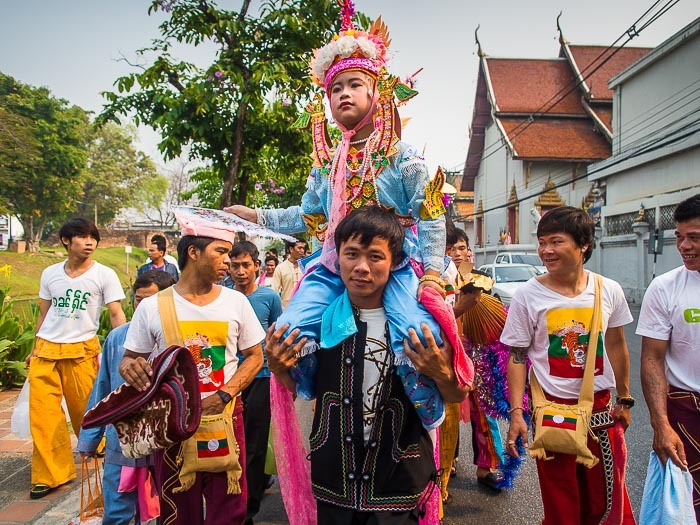 Tai Yai (Shan) boys in a parade marking their ordination as Buddhist novices during the Poi Sang Long Festival in Chiang Mai. The Tai Yai*, also called Shan, are an ethnic minority in northeastern Myanmar and western Thailand. 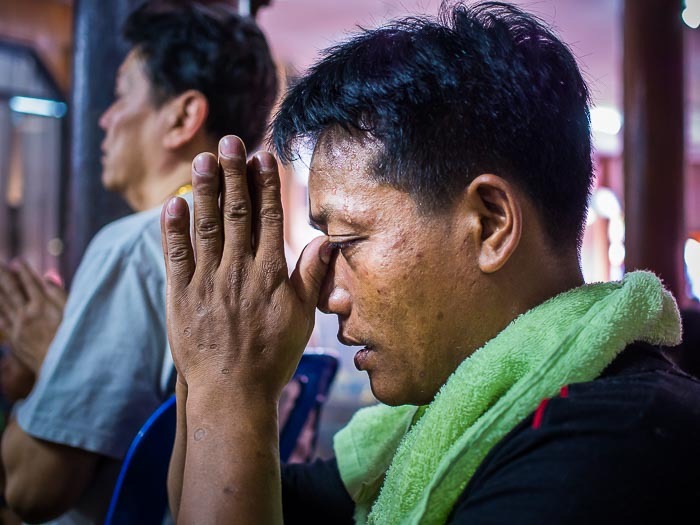 Thousands of Tai Yai people fleeing political persecution in Myanmar have settled in Thailand. 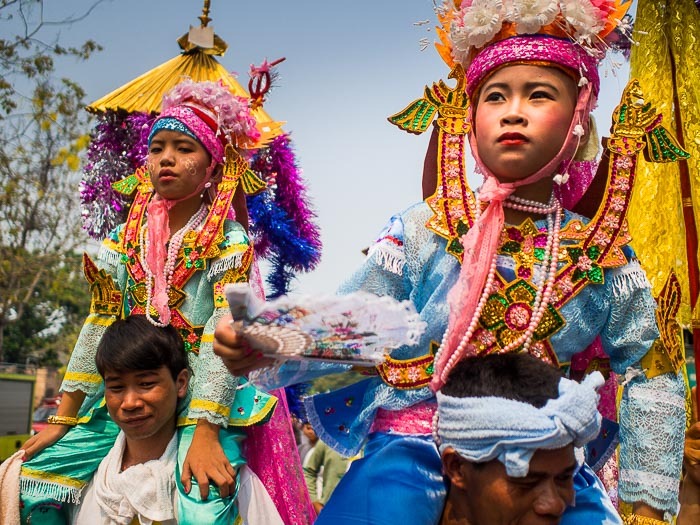 Mae Hong Son and Chiang Mai both have very large Tai Yai communities and celebrate Tai Yai holidays and festivals. The parade winds through the streets of Chiang Mai. 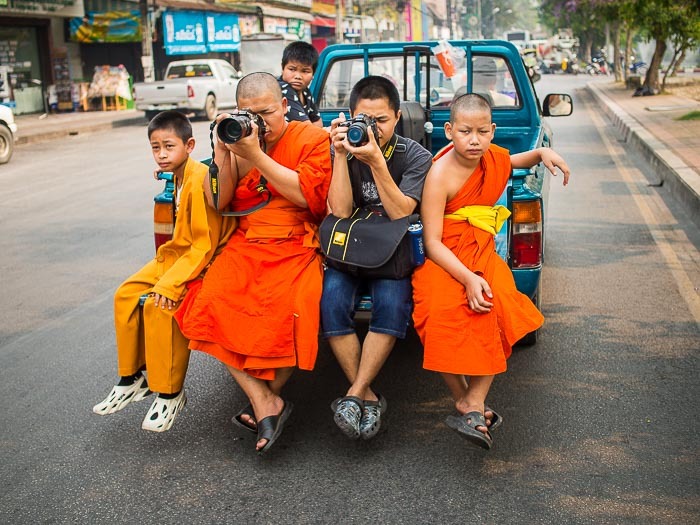 Monks and other youngsters photograph the parade from the back of a pickup truck. One of the biggest of those festivals is the Poi Sang Long, a three day long ordination ceremony for young boys. There is lots of music, dancing and prayer. I went to Poi Sang Long at Wat Pa Pao in Chiang Mai. The boys wear fantastic, ornate costumes and crowns. 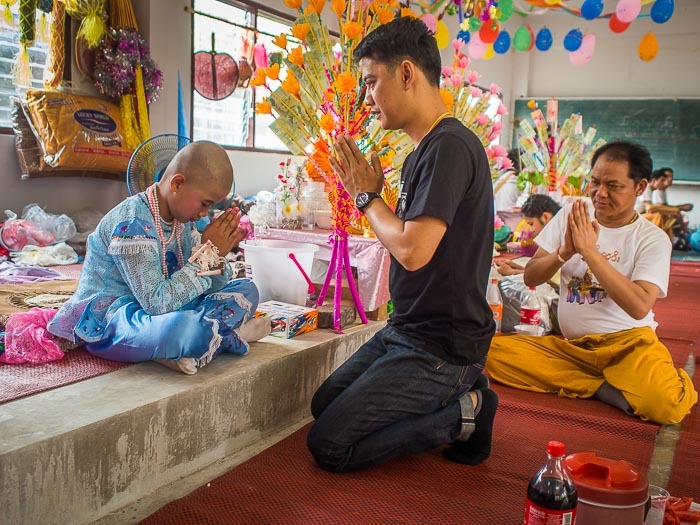 They are treated like princes (Poi Sang Long translates as "Festival of the Crystal Sons"), carried everywhere by men from their families (in fact their feet are not allowed to touch the ground), family and friends come to pray and make merit with them. 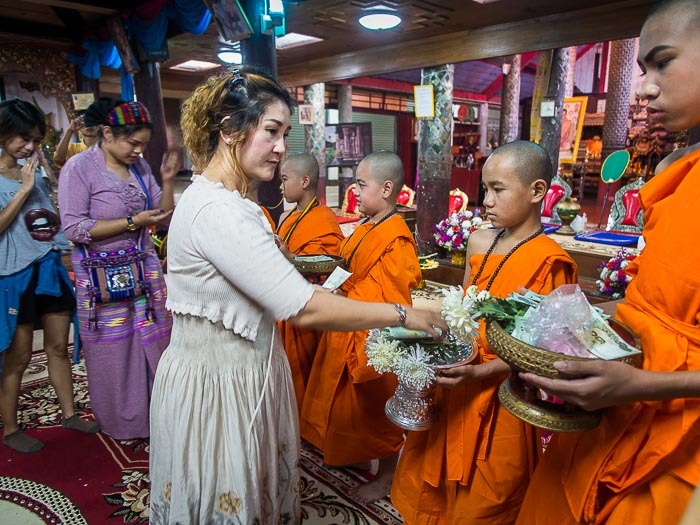 Families put on tremendous banquets of Tai Yai foods and offer it to anyone who passes as a form of merit making. It's a wonderful experience. Men pray with a boy who will be ordained. 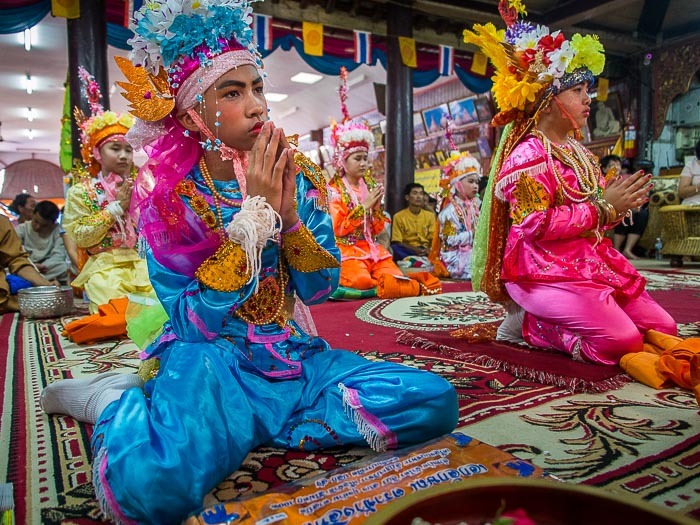 They boys and their families lived in a dormitory at Wat Pa Pao in Chiang Mai during the ceremony. A woman donates money to a boy. 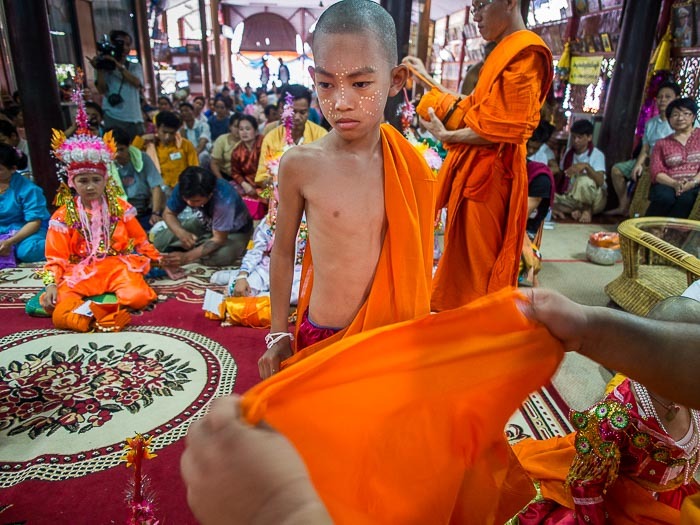 The festival ends with a ceremony where the boys are given their saffron monks' robes. They change out of their princely clothing and into the austere robes of a monk. 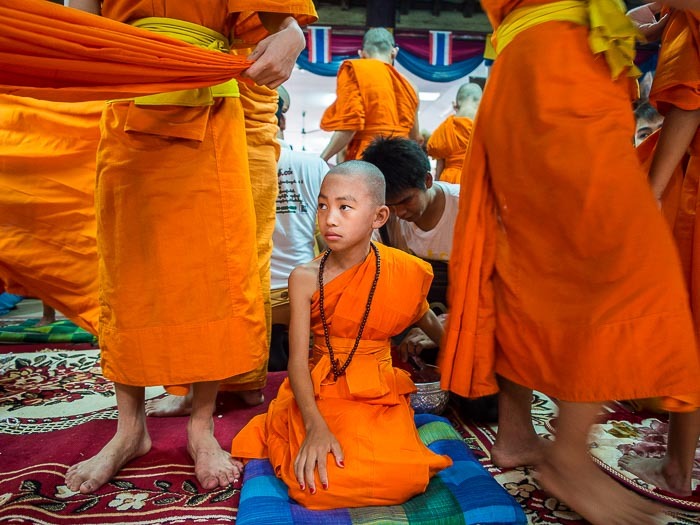 Their final day as princes, the boys pray before getting their monks' robes. Boys change into monk's robes. A man prays while the boys get their robes. At the end of the ceremony, people made merit by making donations to the newly ordained novices. 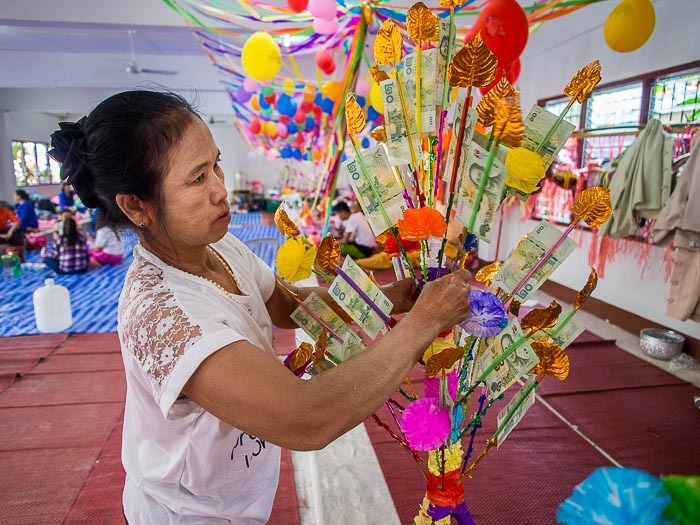 There are more photos from the Poi Sang Long festival in my archive or available from ZUMA Press. *The Tai Yai are commonly called Shan, but they prefer Tai Yai. A Tai Yai man at the ordination ceremony explained that Shan is the Burmese translation of Siamese, but their preference is Tai Yai.